Before I say anything else I will reiterate that I do not encourage most people to keep this species. Although some individuals can make superb pets others can be little short of dangerous. In all cases, to keep even one properly requires a huge outlay in space and resources. I will describe what I have done successfully and leave you to judge. These are a spectacularly large lizard, reaching up to 2 metres in length. As youngsters they are a bright green, often with pale diagonal lateral stripes. As they grow older this green fades. However, as it does so the subtlety of other colours becomes more pronounced and they are never dull. They carry a large row of dorsal spines often particularly enlarged on the neck. Their tails are long and whip-like and their heads large. Their bodies are somewhat taller than wide and this is particularly pronounced in the tail. These features typically reflect that these lizards are both arboreal and water loving. Both males and females have a large throat flap which, especially in males, is used for display. With their size, powerful jaws, formidable claws for climbing, the tail which is used as a whip in defence and considerable intelligence, some individuals can be extremely dangerous. Conversely, some individuals become extremely tame and only inflict unintentional damage with their claws when climbing over you. An example is the female below, who actively enjoyed my visits to schools to talk about herps, where she would frequently be petted by over a hundred children. Given all these factors, and the requirements for proper care set out below please, please think very carefully before you acquire one of these animals. Most Iguanas are obtained as a small (as little as 20cms long) green lizard which is far from intimidating in appearance. Yet, even at that size the first problem is the size of the accommodation. Small as they are, they are active and agile lizards and will already require a very large vivarium. The three key factors to their captive environment are branches to climb, plentiful water and plenty of space. Given this, I would hesitate to recommend anything smaller than a 1 metre x 1.5 metre x 60 cms (W,H,D) vivarium for even a newly acquired animal as it will very rapidly, if properly cared for, grow into this space. Even so, this should only be regarded as temporary accommodation as it will continue to grow and as it does so it will require more space. As adults they tend to be a little less active and thus a proportionately smaller space is possible. With a tame animal that is taken out of its vivarium and allowed to exercise then you might get away with 1.5 metre x 2 metre x 1 metre (W,H,D) enclosure. Having said this, the smallest enclosure I have used for adult Iguanas was 2.5 metre x 2.5 metre x 2 metres (W,H,D). A great many books recommend a water bowl for them to bathe in. I have to say that almost any water bowl is bound to be inadequate for an adult Iguana. The water container should be sufficiently large for the animal to totally immerse itself in - and to do so comfortably rather than having to try to twist itself into a shape that fits! Given this, I would try to make about half the land area in a vivarium of the size above as water - and to a depth of at least 15 cms - preferably more like 30 cms. Bear in mind that they will defecate in the water so you need to be able to change it easily. Almost never mentioned in most guidance is the provision of some from of flowing water. Even a simple aquarium pump creating a miniature waterfall will be immensely appreciated. While not so avidly amphibious as Water Dragons, they do occasionally like to have an early morning bath and shower under the waterfall. It should also be noted that while these animals are incredibly adaptable most come from rain forest, living in trees on river banks and pool sides and prefer a fairly humid environment which only adequate water can supply. Without these features, daily spraying can help but is no substitute for a good representation of "the real thing". The other half of the vivarium base can be filled half with a slightly moist peat/sand mix for egg laying and the remainder solid - with my large vivaria this part is usually rocks embedded in concrete. 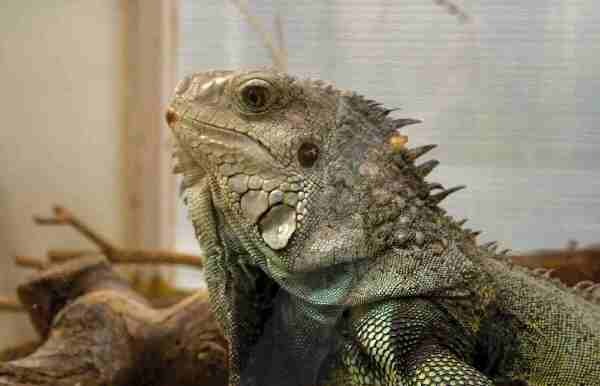 Although it is possible to plant Iguana vivaria it is fairly pointless as they will quickly eat any plant growth. But, they should be plentifully supplied with securely anchored logs both upright for climbing and more or less horizontal for basking and resting. UV lighting is absolutely essential This is best provided with something like a Mercury Vapour bulb such as Mega-Ray. Take care to ensure that the animals cannot touch the bulb and burn themselves and that the bulb is at the optimum distance form a suitable basking station. As with most lizards, they should also be able to find secure resting places away from the UV source. Their temperature range should be much more varied than generally recommended both daily and seasonally. They are NOT subjected to constant temperatures in the wild. My animals had a summer temperature gradient in the vivarium of 30-40C with a hotspot at 45C. At night times this can vary from 20 - 30C. For a couple of months during the winter the day time temperature is reduced to 20 - 30C with a hotspot at 35C, night time temperatures being allowed to drop to 15-20C (although they have had no problems with occasional nights dropping to about 10C). I have also observed Iguanas making use of caves as a refuge in hot conditions so I am sure it would prove beneficial to use these. At one time, I had to temporarily house an Iguana in a vivarium of appropriate size, temperature etc but heavily planted. I was treated to a sight which few people would see outside the wild. To get at some particularly succulent shoots the Iguana hung from a branch its back legs (used in this manner, their appearance was extremely reminiscent of the way a parrot grips branches), hung down and reached out with its forelimbs to pull the light branch of shoots towards to - which it did successfully and much enjoyed its bonus meal. In my experience mating normally takes place in March. I think this was driven as much as anything by wet weather which is often a breeding trigger for tropical species. The male displayed to the female by extending his dewlap and shaking his head vigorously. On this occasion she appeared receptive (he had tried previously but she had first moved away from him and when he persisted actually bit him). He grasped her by the spines on the back of the neck and quickly aligned his cloaca with hers. They remained mating for about 15 minutes. About 2 months later the female dug a hole in the nesting area provided and, overnight, deposited 47 eggs. Two of these were collapsed and off-colour. The remainder were apparently OK. Since these lizards are unsuitable for keeping and as people have come to realise this supply has outstripped demand I did not incubate the eggs. A small sample were opened and carefully examined and were fertile. The remainder were fed to other large carnivorous lizards! Quite simply, for all ages, a wide range of predominantly green leaf vegetables should be given. Do NOT use Spinach as this inhibits calcium absorption. Curly Kale, Dandelion leaves and flowers and Convulvulus (Bindweed) are all good foodstuffs. Fruits should only be given in moderation. All food should be dusted with a suitable multi-vitamin. Most Iguanas will take large insects such as Locusts but these should only be given very rarely as a treat - one once a week is more than enough! DON'T! If you really must, use a reputable specialist pet shop (although such a shop is the least likely to stock them). Much, much better, use the Internet or local wildlife rescue centres. No reptile is rendered homeless by virtue of outgrowing its owner more often.